For once I agree with Gould. We should have no fears or worries about where JC is coming from and where he will be taking Labour. I think that we are supposed to be reassured by the idea that Corbyn’s economic policies are based on a common sense Keynesian approach. I don’t find that at all reassuring. Once we accept the idea that government borrowing and or printing money can, in certain circumstances, be a good thing (not and idea unique to Keynes) then things get complicated. If we imagine that we can find our way through those complications with a good dose of “common sense” then we are on a road to failure. Common sense economics only works for those who want to keep things essentially as they are. 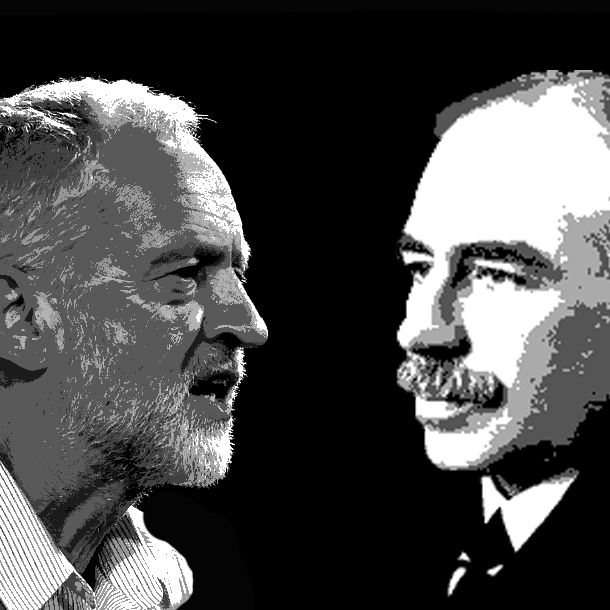 We need to see a proper discussion about what Keynesian solutions mean for socialists. Keynes saw himself as a defender of capitalism. He believed that he had found a way to control capitalism’s inherent tendency to produce economic crises. He was certainly no socialist. His ideas tuned with the economic mood of the post war period although it is legitimate to ask just how much governments actually followed his policies in that period. His solutions certainly tuned with the non-socialist policies of post-war social democracy but whether they can lead to solutions that would face a left government in 2020 is quite another matter. This all requires a full discussion. The lack of interest in debating economic issues is a great weakness on the left. Very worrying. Tomorrow Bill Mitchell, the MMT economist, Richard Murphy and Anne Pettifor are going to be discussing economics for Corbyns team in London (27th August). I think there will be a video. In the interim, the “billyblog” is an excellent source of economics for the left. It is brilliant. Insofar as they have any idea of class antagonism the MMT theorists, like Keynes, see the problem as Industrial/commercial capital with labour against finance capital. Is this really compatible with a socialist analysis? (It is worth noting in passing that it is a view often embraced by the extreme right.) Beyond that economic problems are reduced to purely technical problems in which class antagonisms play no part. In other words the MMTers are yet another school of thought claiming to have found a way of making capitalism work, without crises and in the interests if the great majority. Ann Pettifor, apparently an economic advisor to Jeremy Corbyn, in her book Just Money, puts it very clearly. We do not have to reinvent the wheel. We do not need a social revolution. We simply have reclaim the knowledge and understanding of money and finance; knowledge that has been available to society for many centuries. Is this really the sort of analysis with which a transformation of society can be guided? Or is it a case of the left following the lead of the right and deciding that capitalism really is the only show in town? I have to agree with David. Corbynomics is largely nonsense although it makes more sense than austerity if you are poor or working class or a middle class striver or small businessman on the verge of bankruptcy but it will end in the eventual return to an even more right wing government when it fails. If New Labour were cynical realists (There Is No Alternative) the Labour Left can often be described as cynical idealists (simple technical fixes and a nice attitude are all we need – Keynesianism, pacifism, reformism). No it is important that whilst we support whole heartedly Corbyn’s leadership bid that we counter pose our own programme for working class power and the transition to socialism to an economic programme based on the impossible smoothing out the contradictions of capitalism. Unless the working class seizes state power and ends private appropriation of the social surplus there will never be socialism.